Legal Opinion Letters Formbook, Third Edition, is an invaluable resource when you need to render a legal opinion letter for various types of financing transactions. Basics and advanced topics about legal opinion writing are included. Numerous forms, with commentary, are featured from contributors with expertise in their respective fields. The book has a unique chapter on intellectual property, and forms and examples are included in the appendices and the CD. A chapter, not about third-party opinions, but a useful presentation of intellectual property opinion forms with commentary for patent, trade-dress, and trade-secret opinions to the client. AND a CD for ready and convenient access to the book’s forms. 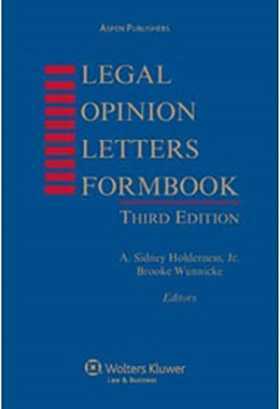 Legal Opinion Letters Formbook, Third Edition is not a treatise but a “how to” book for both lawyers who want to become proficient in third-party legal opinion practice, and for lawyers experienced in this practice who want to renew their knowledge in this area.